Last month, I wrote an article about a Facebook tool called Audience Insights and how it can help advertisers know and target their audiences more efficiently. So I decided I would analyze another tool for advertisers on Facebook that helps to create more granular targeting: Facebook Custom Audiences. 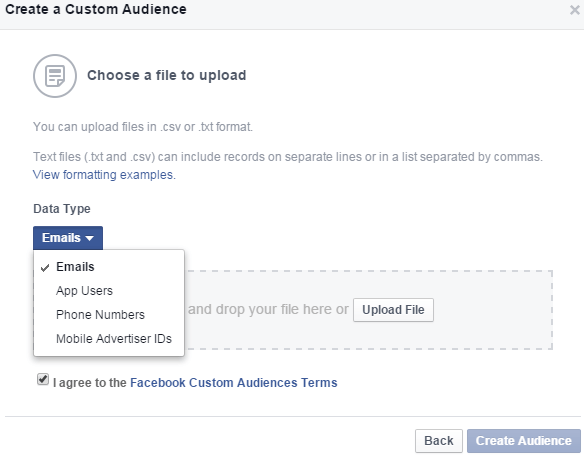 Facebook Custom Audiences is a unique way for advertisers to target people they already have existing relationships with. By uploading a list of emails or phone numbers, advertisers can create a specific group of people to target with their ads. Setting up a Custom Audience is quite simple. First, you need to create a list of consumer emails, phone numbers, app user IDs, or mobile ad IDs of people you already have relationships with. This list needs to be a csv or txt file and needs to contain at least 20 customers. Then select Tools>Audiences. Next, select Create Audience>Custom Audience>Customer List. At this point, you have a few options. You can upload a file, copy and paste your custom list, or import from MailChimp. Next, select your data type and upload your list. Finally click “Create Audience,” and give your audience a descriptive name. Once uploaded, Facebook filters through the list and the data for a customer matched with information in a user account. Advertisers can then show ads directly to those consumers. The main purpose of using this type of advertising is to either develop recurring business or push consumers further down the sales funnel. That being said, there is a lot of flexibility with who you can target through these campaigns. Advertisers can target their most loyal customers and encourage them to continue purchasing, help turn Marketing Qualified Leads into Sales Qualified Leads, or simply just try to have contact with a customer who showed interest in an offering. Typically, these campaigns do not spend as much as normal ads and have better conversion results than other types of campaigns. This is because the ads are shown to those who are already familiar with the company or product. Here is an example of when we used Custom Audiences email retargeting as part of a company’s advertising strategy. This data was taken from all campaigns running on Facebook during a six-month period. Due to the limited audience size of Custom Audience campaigns, spend was 59% less for these campaigns compared to spend on other Facebook campaigns. However, Custom Audience campaigns clearly outperformed the other Facebook campaigns in conversions, cost-per-conversion, and conversion rate. Recently, AdWords released a product called Customer Match, which is very similar to Facebook Custom Audiences. With AdWords Customer Match, advertisers can upload a list of customer email addresses and show them ads on Google Search, YouTube, or Gmail when they are signed into their Google accounts. Customer Match has similar strategy and benefits to Facebook Custom Audiences. Namely, you can be intentional about who you are showing what ads to in order to drive customers toward a purchase decision. However, there is one big drawback: Up until this point, Google has not given advertisers the ability to show ads through the display network. This type of targeting would be a huge advantage, but advertisers will have to wait to see if/when it becomes an option. 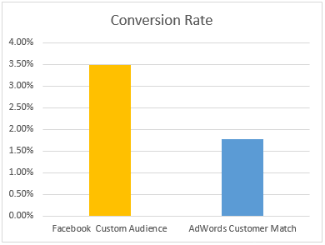 Here is a comparison of an AdWords Customer Match campaign on Gmail vs a Facebook Custom Audiences campaign. Both campaigns were advertising the same product with the same email list and similar ad copy during a two-month period. One important thing to note is that during that time, the spend of the Customer Match Gmail campaign was 95% less than that of the Custom Audiences campaign. As you can see, the cost-per-conversion was better for the Customer Match Gmail campaign. This is largely due to the small amount of overall spend that it accrued during the two months. 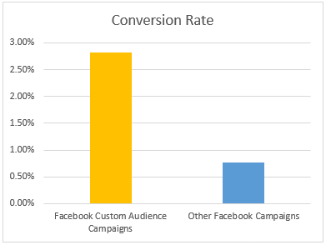 The Facebook Custom Audience email campaign had a much better conversion rate and far more conversions. While AdWords Customer Match has a lot of upsides, the efficient and cost-effective targeting that Facebook Custom Audience provides makes it a must-use in digital advertising. There are numerous ways to apply this tool, but, if used correctly, it can ensure that the right ads are being shown to the right customers. Have more insight into or have an application for Facebook Custom Audiences that you have found to be especially useful? Continue the conversation below or on Google+.